Please allow me to introduce you to the joys of MyGov. As an IT professional anything I can do on-line, I will. Certainly saves standing in queues. For overseas readers (or newish arrivals to Australia) we have a few government services we can access through a central portal and single log on. I quite like it. When it works. Quite snazzy in a governmental sort of way. When you first set up your account, which I did when it was tax return time, it IS a lengthy process to identify yourself to the various member services. For the Tax Office you need your tax file number, your last assessment, your bank account details and the gross amount from your current year’s payment summary. When I did it, it said either of the prior two years would be accepted, but no, it only accepted the current year. Once you have created your MyGov account you have the meaningless username you will never remember and an equally difficult password. I use a KeePass Password Safe to keep track of these things. That way I only have to remember one complicated password! Just don’t lose your KeePass file! Then I linked my Centrelink account, Medicare and my eHealth Record System accounts. I had signed up for eHealth when I very embarrassingly couldn’t remember when or where I had had a procedure done some years ago, or by whom. I thought with an ageing brain pulling all this stuff together in one place sounded like an eminently sensible idea. Let them track it, rather than me! I thought it would be great for the kids to have complete records too, so set up the three under eighteen. You can set up your MyGov account to send a security code to your mobile phone when you log in. Much better than those silly security questions: I can never remember exactly what I typed. Did I use capitals? Did I say school or primary school? The code is quick and easy and I love it. Provided your mobile isn’t on the blink, of course. There is a mailbox so no chance of the kids losing vital communications. Very useful, let me tell you! The other main buttons there I won’t bore you with, the most important are the buttons at the bottom of the screen – the services you have personally linked. I have discovered some work better than others. The Tax Department site I was pretty happy with. It worked well, was intuitive and usability wasn’t at all bad. Congratulations Mr Tax Man! My only complaint was it is impossible to go and reprint an assessment when you need it for something else, such as one of your kids applying for Youth Allowance or applying for a bank loan or any one of a number of other uses you may have for a tax assessment notice. Why not let taxpayers reprint their tax assessment notices? Centrelink seems to have a few functional issues. I reported some of them and received a very nice thank you letter for helping them to improve their web site. It you want to send them a message, the final screen of the process seems to just hang…..and hang…..until eventually in frustration you just close the browser window. There is an area to request forms and an area to upload forms to Centrelink except the latter was crashing for forty-eight hours so I reverted to snail mail to submit a form. Would you believe when I went to grab an image of the error message tonight for this article, they’d fixed it! So now they have the form twice. I do hope no confusion results. Notice the message about the school kids bonus? That’s been there for days. I don’t know what it means, but I’ll be interested to see how long it takes before the message disappears. It is certainly an apology of some sort! 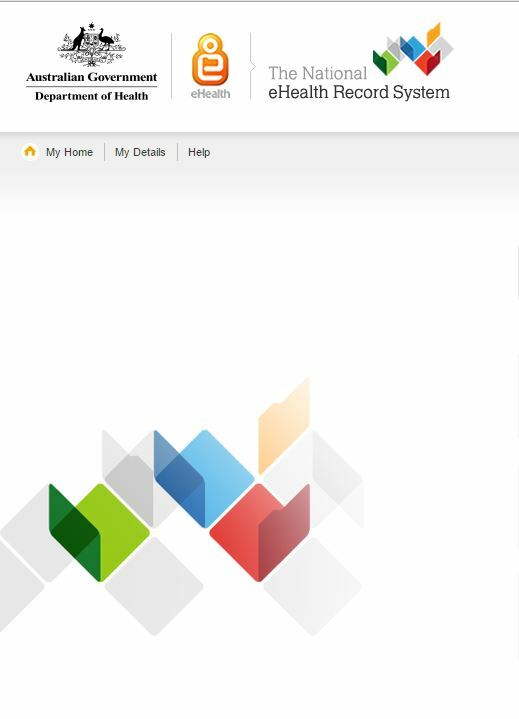 Notice also the Return to MyGov button in the top right hand corner. Very useful that is. 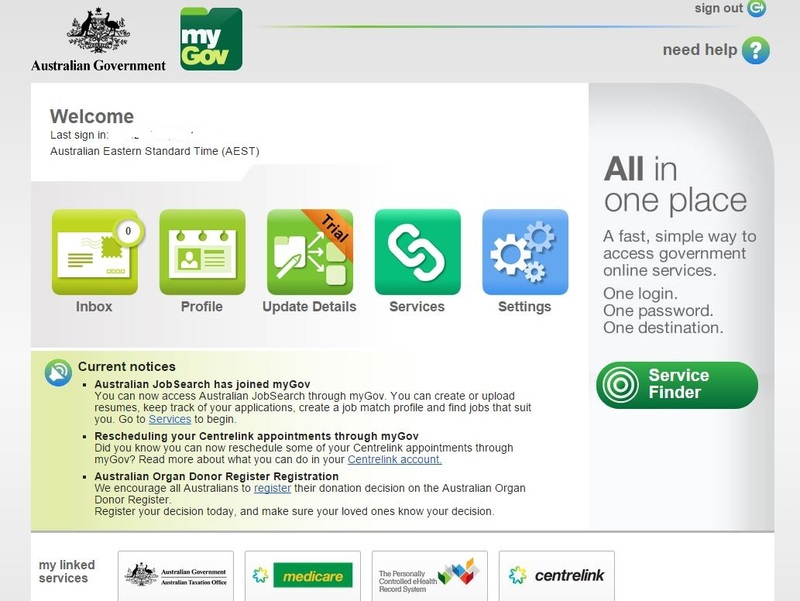 It is on the Medicare, CentreLink and Tax Office pages – but not, for some inexplicable reason, on the eHealth screens. Once you get into eHealth, your only option is to log out and you are out of everything. Inconsistent. Confusing for the users. 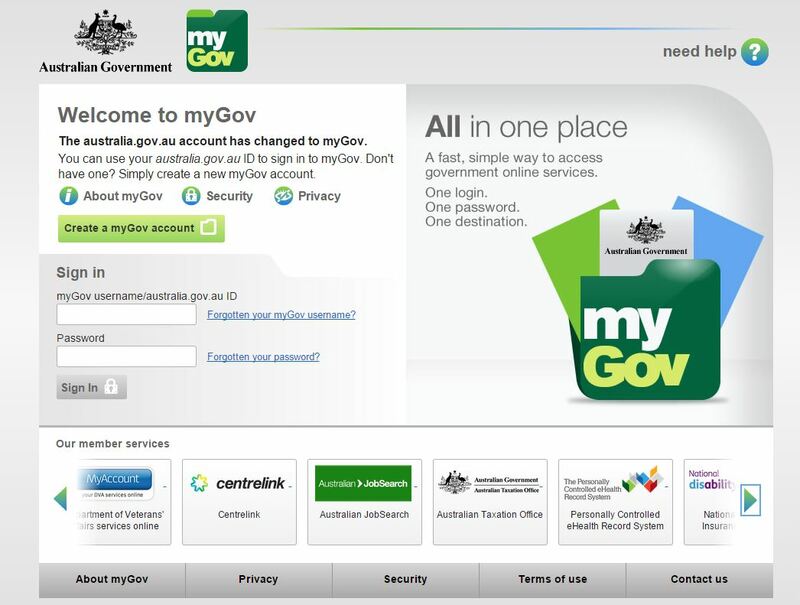 When you are in the Tax Office and click to return to MyGov, you are taken to a different MyGov screen than when returning from Medicare or Centrelink! Why? 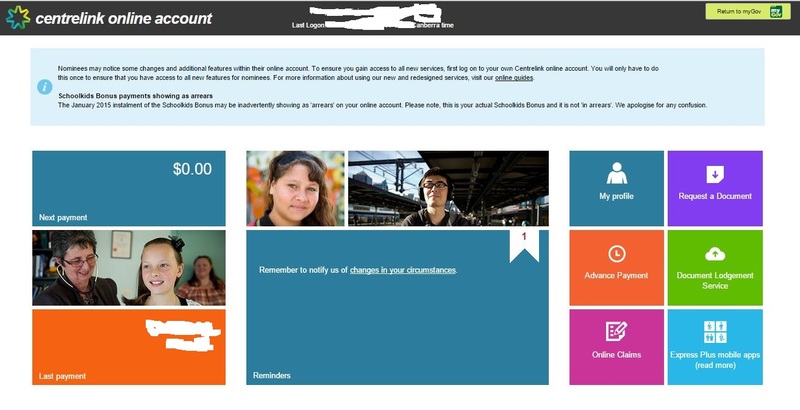 Once on the Centrelink site I completed some details on line and got myself in a loop because I’d get to the end of the section and the system kept telling me I had not entered all the required information, but wasn’t smart enough to tell me what it was I had omitted. VERY FRUSTRATING! It took me ages to work out it was to do with a date that I had entered, but that didn’t fit their criteria for that particular question. Usability flaw! I must have gone through five screens five times before I figured it out. Very grumpy I was. A nice red arrow or something would have been useful! Error trap on the screen with the problem even, don’t wait until four screens later to tell me I got something wrong five screens ago and take me back to the first screen again! When I was helping Miss O 1 link her Medicare to her MyGov it wanted information about the last doctor she saw. We think we had it right, but the computer said NO! So that is one problem we haven’t solved yet. Now eHealth I’m struggling with, really I am. I know it is new, I know health providers are progressively getting involved and I know there has been resistance from some quarters about the whole system, but I personally think it is useful. This is only the left hand side of the eHealth home screen – the right hand side I am not sharing as it is a list of full names and dates of birth for the children and I. Overall, the snazziest of the five sites. Love the logo, modern and fresh, the buttons are big, usability is great. I took “share your health information” to mean all my recent scans and blood test results would be there. After all, one place had scans available on my mobile phone five minutes after I had the scans! Surely they would be on the big fancy new eHealth web site? Well, actually, no, they are not there. I dug a little deeper into the FAQs (that means Frequently Asked Questions for the uninitiated) and found out why. So I’ll check in mid-2015 and see what I can see! Hopefully more information that I see on these two screens. After all those blood tests too! I do think the colour scheme could be a little nicer on these screens. They don’t live up to the promise of the lovely home screen at all. The bright orange clashes with the purple and when expanding some of those orange boxes that do have data, the column is too narrow and the data cut off. Of course that is going to depend on the screen in use and I’ve not tried my large screen yet. These informational screens need a little more artistic flair. Prescriptions are listing nicely, but I’m not sharing a screen shot of my list of drugs! I haven’t mentioned Medicare. It really is pretty basic. You can lodge a claim on-line but who needs to these days as most doctors and other medical providers (pathology, imaging) lodge it for you at the time of consultation. You can change your bank details, but most of us don’t change bank accounts very often. So there you have it – a run through of some of the Australian government services you can now manage on-line rather than line up in queues. Certainly preferable to calling them on the phone. One day I waited on hold for forty minutes. Who has forty minutes to wait on hold? I’m rather liking it over all, just a few minor design flaws and usability issues. Reliability seems to be an issue with the Centrelink site, but it is probably the most functionally rich of them all, therefore also the most complex behind the scenes. Have you been using the on-line services? Have you enjoyed the experience or found it all a bit challenging? I have recently changed my mobile phone and forgot to update my details on the myGov account. I did update the number on my Centrelink account.. I cant access my myGov account now as it sends the security code to my old phone number. The myGov site says to telephone for assistance. When I did this, the assistant said that I would have to set up a new account. Whilst I was on hold, as he was checking this option, I tried to open a new account but it said that the email address was already in use. When I mentioned this to the assistant he advised me to set up a brand new email address, set up a new myGov account, re-link all my other accounts to this one and then delete my old account. I told him that I wasn’t prepared to set up a new email address and it seemed like a round about way of sorting it out. I currently have no access to my myGov centrelink account, where letters are sent to me, or my tax account, where I would like to check out my student help loan payments. I can supply my account number, password, tax file number, centrelink number and my old mobile phone number, surely that’s enough. I have sent two complaints in the past few weeks, about myGov non-access and not received a response as yet. myGov – IMO such a farce! I came here looking for, well… commiseration, I guess. I have spent HOURS today trying to work things out. My account went along swimmingly until I wanted to update some information and then I couldn’t find the very thing I had clicked on a minute before. Then if I clicked on the HOME but it simply logged me out. Later I decided to help my memory-strapped husband find information on his MyGov. Managed to get the username and code easily enough but when they were entered I got the red-lettered “apology” saying that I had not answered the secret questions correctly. The thing is… There were no secret questions! Also I received an email saying that I have a letter from Centrelink but nowhere is there evidence or a notification, not even an inbox – nothing. I’m a big fan of something like eHealth, but I’ve had chats to a few different GPs about it, and the problem is that they all use different proprietary systems. Now I’ve got a chronic illness, so I’m a prime candidate, but one GP hated the concept and preferred the old fashioned way of faxing or emailing. Additionally, I believe that the hospitals are in a similar boat – they need to change their systems to link in and haven’t done so, although may have done so by now. Imagine this working together with telehealth, especially in rural areas, go to your practice where a nurse can do all the physical stuff that the doc or specialist wants. Hi David, yes, those of us with chronic conditions see the benefits quite quickly I believe. I’m under three specialists, a GP, physiotherapist, and have various imaging and pathology providers. The systems side of it is really not that complicated, even with different systems. The proprietary system vendors really need to write a small data extraction procedure that could be run every night outputting the required record structure and it could be automatically uploaded. This could become more sophisticated in later versions. Same with hospitals. Imaging is due to start being available from mid-2015, so I will be interested to see how it looks. The benefits for health would be massive when fully operational. Some of our medicos are a little technology-shy, but there are doctors out there driving change and bringing reluctant doctors on board. Doctors are no different to the rest of the population – some of them are a little wary of technology! Certainly for remote areas and mobile workers it would have considerable benefit. I see value in the data analysis that could be done across the health portfolio, looking at pathology and imaging per condition by age group – the possibilities are great! I’m a “gunna” with this – I know I should do it by Tax Time but have been putting it off. Thanks for all the info. Good luck Archie! I’m sure you’ll be fine, you are technically literate! If you strike trouble, I have to say their technical Help Desk is excellent! At least the times I’ve spoken to them. I had to register to submit my tax last year, but since we’re not residents yet, and aren’t entitled to anything else, no other services are linked yet. I thought it was a good idea, and will obviously save time hopefully. STILL not residents, Sami? I thought you were well on the way! It does save going into the actual offices, but there are some forms you can’t download and other points I haven’t raised (or I would be writing a user manual) so there are still refinements necessary. Which they need since they keep gutting the staff numbers. This is a great tutorial article for those of us who can struggle with a lot of the available online govt. sites. Thanks Robyn, this is one article I will put into my ‘save’ do not dispose of file.